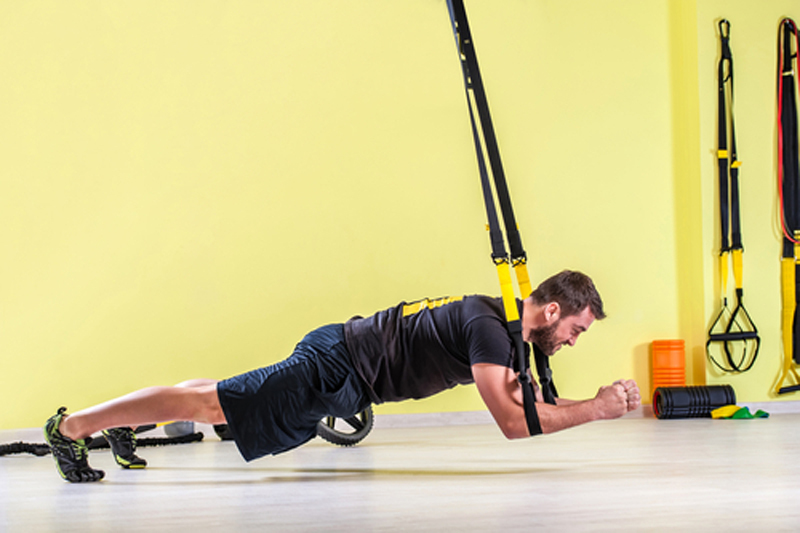 Suspension training (or TRX) is a great alternative way of completing body weight-based exercises that can be varied, challenging and even fun! So, if you're aiming to increase your physical performance and core strength or generally looking for something different, add these five exercises next time you’re at the gym. We’d advise 2-3 sets of 10-12 repetitions per movement for the ultimate benefits! Grip the handles tightly and lean back, so your torso is around 45 degrees from the floor. From here, squeeze your abs and pull your chest towards your hands and revert to the starting position. Tighten your grip on the handles and take a slight step backwards, then squat so your bum just about passes the level of your knees and your arms straighten, then explode through your feet to get some airtime, ensuring you land with soft knees. Place each foot inside the stirrups and then extend your body into the press up position. Whilst keeping your abdominals engaged, bend through your elbows in the press up and control the movement back into the starting position. Stand directly underneath the suspension unit whilst gripping the handles tightly, then push the handles outwards, so your arms are parallel with your shoulders and then alternate lunges between your right and left leg. Assume the press up position like you did before, but this time pull your knees into your abdominals, whilst keeping your back straight and your torso as still as possible. Before commencing with any fitness orientated programme, you should complete a Physical Active Readiness Questionnaire (PAR-Q) to ensure you are fit and healthy enough to pursue it. If at any stage after completing your PAR-Q you feel unwell or incur any injury, stop and seek advice from your doctor. Prior to starting any training, you should always perform an adequate warm-up & always cool down after a workout to reduce the risk of any injury. A gentle 5-minute cycle is the perfect option for a warm up. However, if you ever need further advice on warm ups/cool downs, speak to a fitness instructor or personal trainer, who will gladly give you some tips.